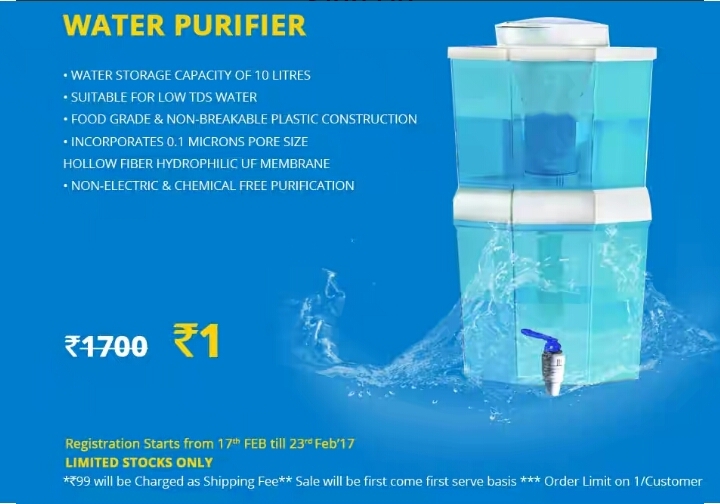 Hi Friends , Here Again Zotezo The Site, back with another offer as Flash Sale of water Purifier at Rs.1 and helps you to Celebrate Living through its services. Zotezo.com is way beyond an eCommerce site on health, beauty, fitness, wellness and integrates the fun of social media in your online shopping. Zotezo Runs Rs.1 Flash Sales regularly And This Time They Providing Water Purifier In Just Rs.1 Which Is Worth Rs.1700 .Don’t miss this chance to get it. Follow the below steps to grab Zotezo Flash Sale Of Rs.1 Item Water Purifier! -Rs.99 will be charged as shipping charges. -Sale will be First come first serve basis. -One customer can purchase only one quantity.